Welcome to All Blinds – Lexington, KY! All Blinds is a full-service window blinds company serving residential and commercial customers in Lexington, KY and throughout all of central Kentucky since 2001. Our goal is to ensure the complete satisfaction of every customer, while offering knowledgeable and friendly window blind service. We carry a wide variety of blinds styles and provide professional measuring and installation. We also clean window blinds using Ultrasonic Technology. 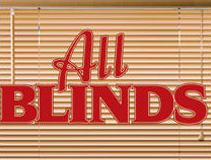 All Blinds is able to provide nearly any type of window blind service that you require. However, if you don’t see exactly what you’re looking for here, please contact us and we will do everything we can to satisfy your needs.